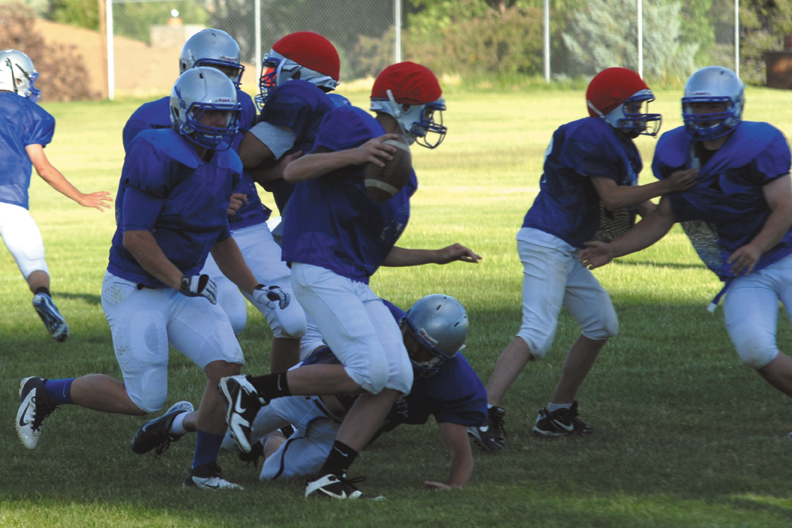 Quarterback Matt Hamilton tries to avoid the defensive rush at Moffat County High School during the football team’s camp in June. The Bulldogs' schedule for this season has been released. The first game is Saturday, Sept. 1 against Ridgeview Academy at home. Quarterback Matt Hamilton tries to avoid the defensive rush at Moffat County High School during the football team’s camp in June. The Bulldogs’ schedule for this season has been released. The first game is Saturday, Sept. 1 against Ridgeview Academy at home. Staying in the 3A classification this year means the Moffat County High School football team will play mostly familiar teams. But, three new opponents also appear on the Bulldogs’ schedule for 2012. After a 3-7 season in 2011, MCHS will look to get off to a hot start, playing games against all the teams it beat last year over the first half of the 2012 season. MCHS foes in 2012 amassed a 48-54 regular season record last year, highlighted by the team from Rifle High School going undefeated and making the final eight in the Class 3A state championships. Including Rifle, three teams on this year’s schedule made the state playoffs. Battle Mountain High School was knocked out in the first round after a 9-1 regular season and Palisade High School made the state semifinals, finishing 10-3 on the season. Schedules work on two-year cycles in which teams alternate home and away games. Having to set up a new set of non-conference opponents, Moffat County School District Athletic Director Jeff Simon was pleased with how the schedule worked out. Cortez once played in the Western Slope League, and is returning to the league this season. In addition to new teams Ridgeview and Cortez, the Bulldogs will play Summit High School in the sixth game Oct. 5. Summit went 6-4 last season, including 2-1 against teams MCHS will play this year. By remaining in Class 3A this year, MCHS will play in one of the state’s top conferences, Hafey said. “Our league, year in and year out for the past decade, it seems like has had somebody playing for the championship or winning it,” Hafey said. “I believe it’s the toughest 3A league in the state.